"In the 1870s, a stone inscription was allegedly discovered in Paraíba, Brazil. A transcription was shown to Ladislau de Souza Mello Netto, director of the National Museum of Brazil. Netto accepted the inscription as genuine, but when it was later stated to be a hoax, Netto backed down and blamed foreigners for its fabrication. 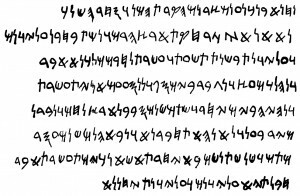 In the 1960s, Cyrus H. Gordon believed the inscription to be genuine and created a translation which begins, "We are Sidonian Canaanites from the city of the Mercantile King..." The inscription's letter forms are variations that individually occurred and disappeared over a span of 800 years and so the confluence in a single piece of writing verifies the inscription as a hoax."